As a non-fan of baby-back ribs or unlimited breadsticks, I tend to avoid the giant sit-down restaurant chains. I am fortunate enough to live in a major metropolitan area, so why would I go to Olive Garden when there are so many superior Italian restaurants around? But I have one glaring exception, a lifelong devotion to a certain chain that frequently advertises on TV: I really love Red Lobster. My affection for the seafood chain—which turns 50 this week—stems from a variety of sources: The fact that seafood is hardly ever a thing I cook for myself, so am happy to have someone else kill the lobster or crack open the crab legs. I love the brightly colored laminated menus and the cheerful Mai Tais. I even can find actually informative facts (about sea life) on their kid menus. After a recent domestic dispute, the next day my husband announced that we were going out to dinner, and the destination was a surprise. I gasped as we approached the parking lot: Red freakin’ Lobster. That’s true love all right. But alongside the shiny menus and surf-and-turf combos and jewel-colored drinks, we all know the true highlight of Red Lobster, right? Even better, you receive it right after you sit down. It’s that beautiful, brimming basket of Cheddar Bay Biscuits. My family fights over firsts, and usually needs seconds. So I was shocked when, at a neighborhood party, I dove into a snack that seemed very familiar. 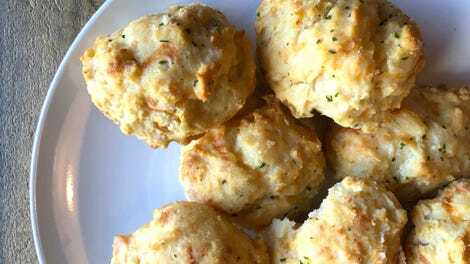 When I queried the cook, I couldn’t believe the answer: She had prepared Red Lobster biscuits at home using the company’s Cheddar Bay Biscuit Mix. Sure, a quick Google search reveals a number of “cover versions,” but here was the exact recipe, tailored to the home cook. How did I not know about this grocery revelation? I follow Red Lobster on Twitter! Inspired, I purchased a box at my local supermarket and prepared to make my favorite restaurant treat at home. It was surprisingly simple. The only ingredients needed are shredded cheese (for the biscuit) and butter (for the herb glaze). While the biscuits baked, filling my home with an aroma so delicious I wanted to bottle it and dab it behind my ears, I prepared the garlic herb butter sauce, which was one stick of melted butter and a flavoring packet. Once the biscuits had cooled a little, I brushed them with the herb butter. It was a little problematic because the herbs kept sinking to the bottom of the bowl, making me realize that the tiny whisk my husband had requested for Christmas could actually come in handy. One stick of butter pretty much saturated the 10 biscuits. 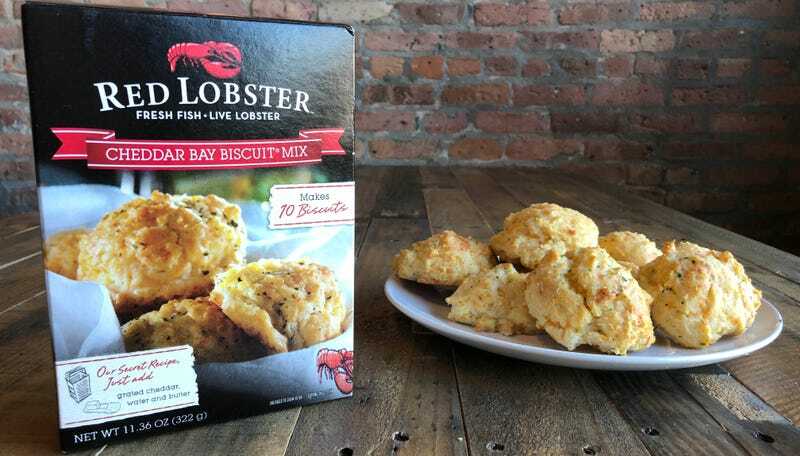 I then delivered the biscuit batch to my co-workers/biscuit-tasting panel, warming them up in a toaster oven in an attempt to replicate the Red Lobster dining experience as closely as possible. The reactions were overwhelmingly positive.